Rainforest lets you review and categorize test results to help you track what is driving test failures. Whenever a test is categorized, it is marked as reviewed, which is helpful for teams working together to triage many results in a run. To review a test failure, go to the test result and click the “Actions” button to select a review category from the dropdown. You can also categorize test failures on the Run Summary page by selecting one or more tests and clicking the “Change Review Status” button. 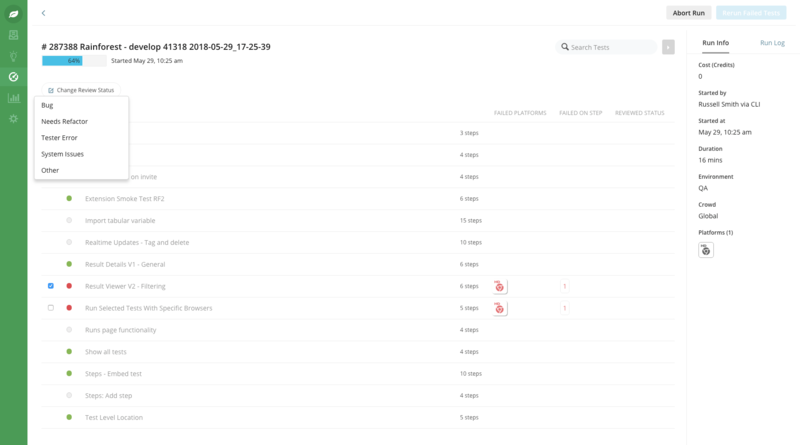 When you categorize a test failure by assigning a status, that status shows up on the run summary, so you can see which test failures have already been reviewed. To see who reviewed the test failure, hover on the “Reviewed Status”. There are 5 review statuses available: bug, needs refactor, tester error, system issue, or other. Note that you can always change the review status or mark it as unreviewed by clicking the same button.